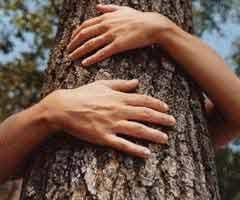 Lubor On Tech: Hugging the Wrong Tree? October 24 is World Paper Free Day. It’s an opportunity to remind ourselves about how far we still have to go towards a significant reduction of paper consumption. Particularly in the office, the amount of paper still in use is mind-blowing. We have been predicting a paper-free office for decades and yet it appears that we have a long way to go. Every one of us knows someone who still prints out all his or her emails… The World Paper Free Day is a worthy cause that we should all be behind. In fact, it shouldn’t be just for a day but for a year. Every year. Wait a minute. Is it really the most important cause? Don’t take me wrong—I may not be wearing Birkenstocks, but I am closer to a tree hugger than a city slicker. Mass scale deforestation is a huge problem. Trees generate oxygen, provide animal habitat, give us shade, prevent erosion, and retain water. Trees are vital to our survival, and we need to protect them. And yet…trees are a renewal resource! The fact is that trees do grow back, and trees for paper mills are being planted in managed timberlands based on a long-term plan. 84-91% of paper pulp is made from waste wood that was traditionally burned, and paper itself is a highly recyclable material. Newspapers, for example, are printed on paper that is made of 20-100% recycled material, and about 75% of print paper in the US is being recovered. Paper is also non-toxic and relatively benign as a pollutant—out of all things that end up in the landfill, paper is the least of our problems. The next question is: what is replacing paper? Sure, bits and bytes in our computers, tablets, and e-readers. But those bits and bytes require energy to run, and in the case of Amazon, Apple, or Google, the “electronic paper” comes out of massive datacenters that require huge amounts of energy. That energy comes from burning oil or coal, which is hardly benign. Also, all those electronics have a limited life expectancy, and the old, replaced models represent a massive pollution issue. They are a huge problem in landfills. Happy World Paper Free Day! I'll bet that Oil Free Day would have some of the same guiding principles re leveraging digital processes. That's why we say that Paper Free is not about the Tree. Thanks Lubor.